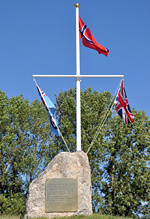 70 years on from the start of Norwegian operations at North Weald during the Second World War, veterans from the conflict and their modern day counterparts returned to the Essex airfield to mark the anniversary and take their part in a ceremony to unveil the "Little Norway" memorial, which also saw the 331 and 332 Squadron revetments re-dedicated to Norway. Dan Butcher reports from sunny Essex. Dean West and Phil Whalley provide additional photos. The first arrival from a fairly large Norwegian contingent arrived on Thursday afternoon, Major Martin "Tintin" Tesli arriving in his newly acquired Canadair CT-133 Silver Star. The only example of the type currently flying in Europe, this was the UK debut for this particular airframe under its new ownership and the visit would be combined with a display at the Duxford Airshow taking place on the same weekend. 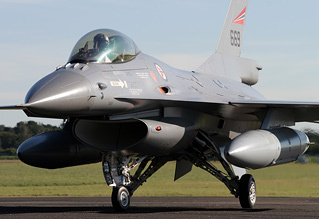 The aircraft was purchased from the US earlier this year and is owned by the F-16 pilot, although it is maintained and operated as part of the Royal Norwegian Historic Squadron. It's Canadian roots can be seen in the fictitious scheme it currently wears, with low-viz RNoAF roundels applied over RCAF grey camouflage. Plans are afoot to return it to an authentic, natural metal Norwegian scheme as soon as next year. 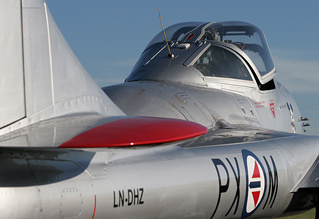 The Historic Squadron sent two more aircraft for the event that have become fairly frequent visitors since their 2009 UK debut at North Weald; the de Havilland Vampire pair of T.55 and F.3 arriving in the UK direct from Norway on Friday afternoon in a little under two hours. Taking slightly longer to arrive, at just under three days for the trip, was a PT-19 Cornell "Spirit of Little Norway", which is finished in the striking blue and yellow trainer scheme used in Canada, where many of the Norwegian pilotss learned to fly. The first of the military arrivals came in the familiar shape of a C-130J, bringing in support equipment for the F-16s that would follow and more importantly, the veterans and dignitaries, including the Royal Norwegian Air Force Major General Finn Hannestad and the Mayor of Bodø, that would take a central role in the weekend of celebrations and remembrance. 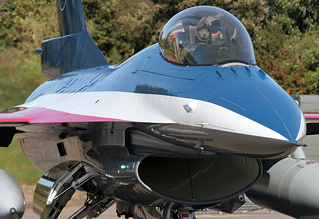 The aforementioned F-16 Fighting Falcons arrived not long after the Hercules, and for the first time at one of these North Weald events the pair were the single seat F-16AM variant, which allowed the Norwegian Air Force to send the special-marked 2012 solo display aircraft for a first appearance outside of Norway. This was the third time that Norway had sent F-16s to North Weald in recent years, but it's still quite surreal to see modern military hardware parked up in and amongst the general aviation types on an open airfield. Present on Friday only was Carolyn Grace's Spitfire MkIXT ML407, flown into North Weald by Carolyn's son Richard to meet the veterans and to reunite Lieutenant Rolf Kolling, 91, with the only surviving Spitfire from his, and the Squadron's, very last operational sortie of World War II, which saw a successful ground attack run against a German convoy on April 21st 1945. Also aboard the Hercules from Norway were a number of volunteers who were on hand to lay turf and add the final touches to the restored revetments - the pens where Norwegian Wing Spitfires sat armed and ready to be scrambled - that would be key to the memorial unveiled on Saturday. Sunday's event was combined with the annual North Weald Fun Day & Fly-In, for which the fee at the gate was a very reasonable £5 per person. 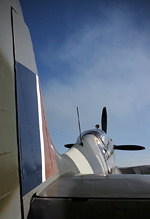 Although flying operations on this occasion were fairly limited until the afternoon, there were plenty more things to see and do on the ground. Among them were static aircraft displays to mark the 100th Anniversary of the RAF's Central Flying School, containing based classic jets such as the Vampire T.11, Jet Provosts and a new addition to the Weald Aviation stable, Hawker Hunter T.7 WV372, formerly of Team Viper. A good variety of other non-aviation related attractions made up the central area of the show ground, with military vehicles, classic cars, Harley Davidson motorcycles and a line-up of TV and film car replicas boasting the likes of Knight Rider's KITT and the A-Team van amongst the familiar funfairs. 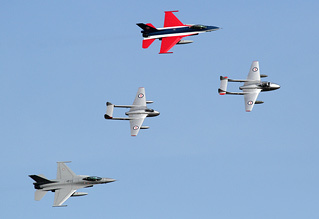 The afternoon entertainment culminated with the departure of the Norwegian aircraft, led by the Historic Squadron Vampires. 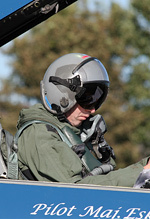 They flew a formation flypast with the F-16s, then headed off to Duxford to display whilst ex-USAF A-10 and F-15 pilot Richard Hess took centre stage at North Weald for an elegant solo routine in the CT-133. The Kent Spitfire, BBMF's Silver MkIX Spitfire and an RAF Sea King also put in contributions to the small flying display ahead of the departure of the C-130 back to Norway, which drew to a close the open day and the weekend of events to mark another significant anniversary for the airfield. These events at North Weald aren't airshows in the truest sense of the word - flying displays are limited and the show ground is a bustling, packed and noisy affair aimed more at the family than aviation enthusiasts, but a welcoming and friendly atmosphere combined with the ability to draw on this airfield's historic past to lure in the likes of F-16s means there's an appeal and a charm to these events unlike anything else on the UK's airshow calendar.